One saying some people often use during times of change in life are "All good things come to an end." In some sense, people may find this comforting because it helps them to, instead at looking only at the end, reflect on how there was good. And maybe it helps them feel like they are not the only ones who've seen something come to an end, if all do. Christians acknowledge that there are seasons in life and many things do come to an end. But we know that not all good things come to an end. Our life continues beyond death. 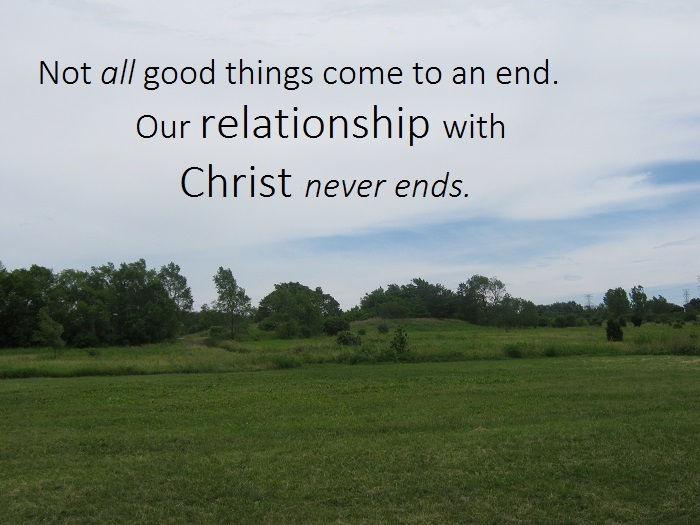 Our relationship with Christ doesn't end. Our family with our brothers and sister in Christ continues. 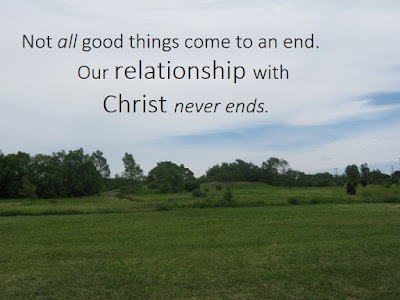 I suppose Christians could edit the saying slightly to "Good things often do come to an end in this life," but that's probably not going to catch on to a popular level. Also, it's more helpful to think of positive things. Like the blessings and gifts in what has just ended and how it's helped us. And what we have to look forward to and have now. We always have hope in God and other things.